First of all you need to grate your ginger on a coarse cheese grater – you can leave the skin on if you like. Put the ginger with its pulpy juice into a bowl and sprinkle in your sugar. Remove the rind from 2 of your lemons with a vegetable peeler, add to the bowl, and slightly bash and squash with something heavy like a pestle or a rolling-pin. Just do this for 10 seconds, to mix up all the flavours. Squeeze the juice from all 3 lemons and add most of it to the bowl. Pour in your fizzy water or soda water. 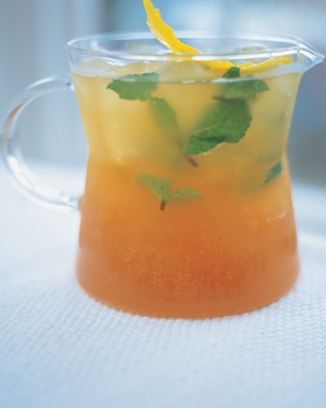 Pass the ginger beer through a coarse sieve into a large jug and add lots of ice and some sprigs of mint. 0 Responses to "ginger beer"